A multi-million pound government land deal has secured plans for a new national medical science centre in central London. The £500m UK Centre for Medical Research and Innovation will be sited near to the British Library and the new Eurostar terminal at St Pancras. It has been chosen from a number of bidders for the plot, worth £85m. The laboratories will undertake research into health and diseases using the latest technology. Up to 1,500 researchers and support staff are expected to work at the centre, which is due to open in 2013. British Nobel prize-winning scientist Sir Paul Nurse, now president of Rockefeller University in New York, is to head the scientific planning for the project. Teams from the Medical Research Council (MRC), Cancer Research UK, and University College London (UCL) will work closely with other scientists from nearby universities and hospitals. 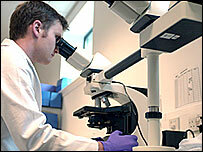 The Wellcome Trust charity will also fund scientists based at the centre. Sir Leszek Borysiewicz, chief executive of the MRC, said: "This centre will be of crucial importance to the UK's plans to ensure that medical research findings are turned into benefits for patients and the economy as efficiently as possible." Prime Minister Gordon Brown said: "By taking groundbreaking scientific discoveries right through to treatment, I expect that the 1,500 staff who will be part of this project will develop many of the cures, vaccines and drugs from which the NHS and its patients will benefit in years to come."